We're off on Monday, so I'll see you in a week. 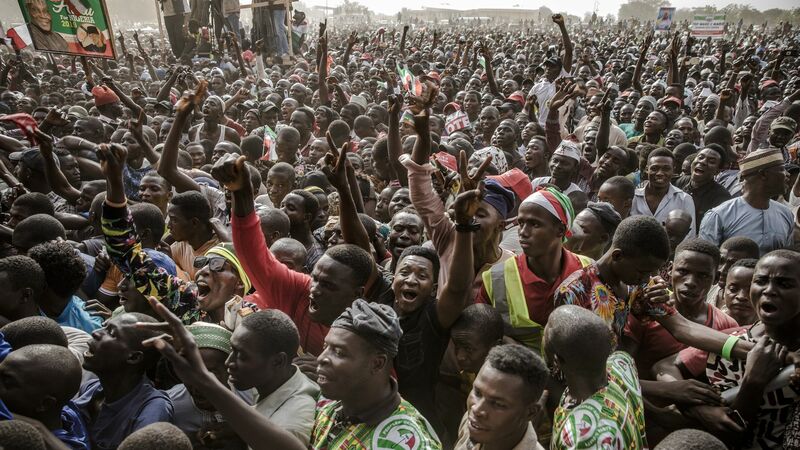 With Nigeria’s presidential election just two days away, two political heavyweights are competing to lead the African giant through a critical four years. Why it matters: The winner will govern a country with massive unfulfilled economic potential and worsening humanitarian and security crises. There are fears a bruising and close-fought election could give way to violence and instability. Nigeria is Africa’s largest economy but the government is almost entirely reliant on oil revenues. The country is ranked among the most difficult in the world in which to do business, due in large part to corruption and insecurity. Incumbent Muhammadu Buhari made history in 2015 — three decades after he was toppled as a military strongman — by becoming the first opposition candidate to defeat a sitting president. Buhari’s appeal rests on his incorruptibility, but institutionalized corruption remains unscathed after four years, according to Transparency International. He is accused of wielding his anti-corruption drive to hammer his political rivals while taking a far softer approach with allies. It has been a grueling four years. Buhari has faced health struggles, economic headwinds and a relentless Boko Haram insurgency. Atiku Abubakar, a former vice president, represents the People’s Democratic Party, which ruled Nigeria for 16 years until Buhari’s election. This is his fourth run for the top job. Abubakar, a wealthy businessman, says he’ll open the country up for more investment. He has been dogged by allegations of corruption and “almost symbolizes” Nigeria's infamous system of political patronage, Page says. Both men are in their 70s. Both are Muslims from Nigeria’s north. Neither is proposing transformative reforms. “This is kind of their last bite at the apple before a younger generation comes in,” Page says. The big picture: The population has doubled over the past two decades to 200 million and is set to double again by 2050 — at which time Nigeria will have the third-largest population on Earth. Nearly 3 in 4 Nigerians polled told Gallup they struggled to afford food over the past year. They’re evenly divided as to whether things are getting better or worse. Confidence in the fairness of elections is improving but still low, while confidence in the government improved after Buhari’s election but has ticked down more recently. John Tomaszewski, Africa director for the International Republican Institute, says that beyond who wins, it’s essential that this election keeps Nigeria’s democracy moving forward. The bottom line: “Nigeria needs to get this right for Nigeria, first of all. That will have reverberating effects all around Africa but also for Europe. This is an important election for the world,” Tomaszewski says. Between the lines: "Really, this move would be about Russia wanting to have the same capabilities that China does — in essence, to be able to control the flow of information into and out of the country," Michael Daniel, former White House cybersecurity coordinator and current CEO of the Cyber Threat Alliance, told Joe. Meanwhile, in New Delhi: "India’s government has proposed giving itself vast new powers to suppress internet content, igniting a heated battle with global technology giants and prompting comparisons to censorship in China," the NY Times reports. Details: Internet companies would be responsible for screening "unlawful" content, the government would be able to demand Google, Facebook et al. remove anything deemed "libelous, invasive of privacy, hateful or deceptive," and messages sent on WhatsApp would be made traceable. "[C]ritics said the changes would violate constitutional protections for free speech and privacy and put India in the same league as autocratic countries like China and Russia. Some of them suggested that the Modi administration was rushing to adopt the regulations so it could more easily pressure the tech platforms to remove social media posts by political opponents in the coming election," per the Times. Egypt's parliament today essentially cleared the way for President Abdel Fattah el-Sisi to rule through 2034. Constitutional changes that "would demolish ... safeguards [Sisi] introduced in 2014" are now on track for approval "within three months," per the NY Times. Flashback: Sisi told CNBC before last year's sham election that he supported the system of "two four-year terms" and would "not interfere" with the constitution. Between the lines: "Washington’s unquestioning embrace of Mr. el-Sisi, whom President Trump has called a 'great guy,' emboldened the Egyptian leader to act with little fear of American pushback," the Times notes. Meanwhile: Members of Congress have taken a series of steps since the murder of Jamal Khashoggi to pile pressure on the Saudis, and in particular Crown Prince Mohammed bin Salman. Trump has rebuffed them at every turn. The latest: The Trump administration missed a recent deadline to assign responsibility for Khashoggi's death and potentially trigger sanctions. It ignored a deadline to certify the Saudis are limiting civilian casualties in Yemen. The House just passed a bill to cut off military assistance to the Saudis in that war — and the White House has threatened a veto if it passes the Senate. Between the lines: The administration has been steadfast in backing the Saudis. But the votes in Congress show the winds outside the White House are blowing in a different direction. Parliament rejected the Socialist government's budget plan, likely forcing Prime Minister Pedro Sánchez to call snap elections. The date may be announced tomorrow and is expected to be in April, per the BBC. The "trial of the century" began this week in Madrid and "pits twelve members of the separatist movement in the Spanish region of Catalonia against the national government," writes Gabe Lipton of GZERO Media. "The defendants are accused of rebellion, sedition, and civil disobedience for organizing what Madrid alleges was an illegal referendum on independence from Spain back in 2017. They face up to 25 years in prison." "Thousands took to the streets in Madrid on Tuesday to protest what they view as the government's soft treatment of the separatists. New protests across the country are all but certain, and will further stoke political divisions throughout Spain." "Only 22% of Catalans believe their leaders committed acts of rebellion, compared to 58% of all Spaniards. The contrast with Spain’s conservatives is even starker: where 87 and 95% of supporters of the center-right Partido Popular and far-right Vox Party, respectively, felt similarly." Why it matters: Sánchez was only able to form a government last year with the support of pro-independence Catalan parties. Now, he has lost it. New elections mean Vox's strength will be tested. The U.K., Germany and France were represented, despite initial reluctance to travel to Poland for what was initially billed as an anti-Iran summit and then became something else — though it was never entirely clear what. While the summit left many observers perplexed, one notable aspect was that Israel and several Arab countries were present — though the Palestinians were not. What to watch: Jared Kushner gave a presentation behind closed doors on the Trump administration’s Middle East peace plan, which he said would be presented some time after Israel’s April 9 elections. Turkey skipped the Warsaw gathering. Instead, President Recep Tayyip Erdogan attended a Syria summit in Sochi with Iran’s Hassan Rouhani and Russia’s Vladimir Putin. Putin said the three leaders agreed U.S. withdrawal from Syria is “a positive step” and that Syrian government troops should fill the void left behind. What to watch: “Almost five years after the militant group’s lightning sweep across parts of Iraq and Syria, the Islamic State is surrounded on all sides and the SDF expects to declare victory within days,” the Washington Post’s Louisa Loveluck reports from Syria. "Someone told our reporter last night, be silent or you're next. I am appealing to you not to be silent, even if, and especially if, you're next. You have to express outrage like I'm doing now." Thanks for stopping by — have a wonderful weekend.